Radio tower painting becomes an easy process when you hire our team. Your radio towers serve an important purpose in that they allow signals for television, telephones, and other devices to communicate. While these towers are likely an important part of your daily life, they can also be a staple landmark as part of your town or city. If you have one or more radio towers that are looking worse for wear, you may be looking for ways to improve their aesthetic for both passers-by and your community members. 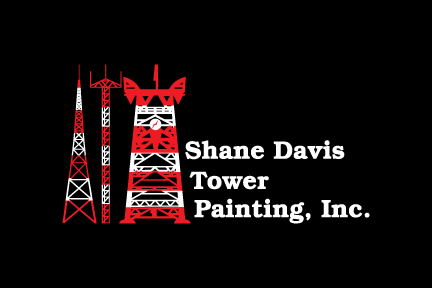 At Shane Davis Tower Painting, we can assist you with radio tower painting that keeps your radio towers looking their best. Just because you have radio towers in your community doesn’t mean that they have to be eyesores. We can work with you to make these landmarks more visible, and even so that they enhance the charm of your communities for everyone who lives there and stops by. It’s important to hire an experienced and reliable company for radio tower painting because this job comes with some risks. While it may seem simple enough to hire a crew to paint your radio towers, in reality, it requires the correct type of paint applied in just the right way to really get the best results. Fortunately, we have the services and skills you need to get great outcomes from your updated radio tower aesthetics. Quality Workmanship – When you hire us for radio tower painting, you’ll be impressed with every step along the way, as well as the finished product. Our quality workmanship provides you with streak-free and uniform coatings, as well as long-lasting results. You won’t need to call us back in six months or a year to repeat the process, but instead can enjoy your newly painted radio towers for many years to come. Experience & Expertise – With 35 years of experience in the radio tower painting business, our highly skilled and experienced team members have the knowledge and equipment needed to do the job right the first time. We use proper protection during the painting process and work with precision and efficiency to ensure the best possible outcomes. Local & Remote Locations – Calling us for radio tower painting is convenient because we aren’t bound by any location locally or regionally. That means we will come to you no matter where you are in the United States. Whether your local municipal city radio tower needs a touch-up or you have a need for national radio tower painting, we can be there to provide the services you need. Radio tower painting becomes an easy process when you hire our team at Shane Davis Tower Painting. We provide additional services, including sandblasting, needle gun rust removal and lead paint containment, to ensure your radio towers continue to look their best year after year. If you are interested in learning more about our radio tower painting services or would like to schedule a quote, contact us today for a free consultation over the phone. We believe we will quickly become your trusted resource for radio tower painting anywhere in the USA. If you’re looking for a tower painting company, turn to us at Shane Davis Tower Painting. In addition to our extensive qualifications and certifications, we only use the best paints when we provide tower painting services. When you work with us, we will ensure that the paint we add to your tower lasts for an extended period of time and that the coats we add are streak-free.